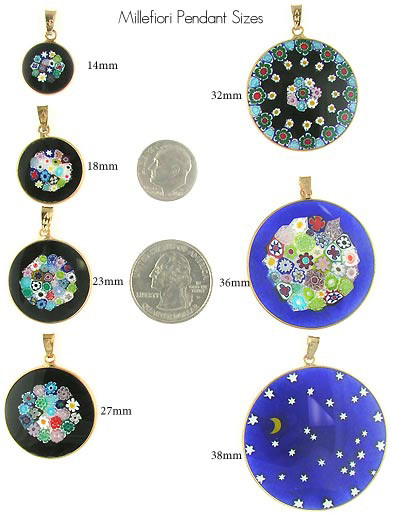 The sizes of the pendants are shown below with coins to give you a better idea of the sizes. Italian products are always measured in millimeters or centimeters. 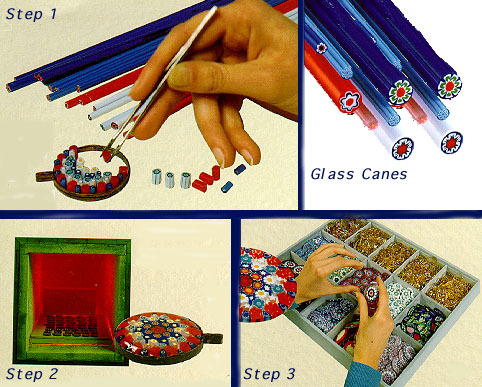 As can be seen in Step 1, the millfiori pendants start out as long slices of cane, the center of which is a pattern of various colors of glass. The canes are then sliced into small pieces capable of fitting into the mold in which the pendant will be fused. Each piece is placed individually by hand to obtain desired patterns. The picture on the bottom left shows the millefiori pendants as they fuse together in the oven. The pendants are then finished and ready to be set in their silver or vermeil bezels.